Packed with beta carotene and other terrific nutrients, sweet potatoes are one of the healthiest starches on the planet. Eat them! Most people think about sweet potatoes as, well, sweet. They are often loaded with gooey sugary sauce, marshmallows, cinnamon, and spices. They are terrific this way, but I’ve always thought the sweet version should be saved for the dessert course. It reminds me of pumpkin pie. If you asked me the question, “Are you savory or sweet?”, I’d have to say savory (in more ways than one!) Put me in a room with salty snacks vs. sweets and I’m headed straight for the sodium. 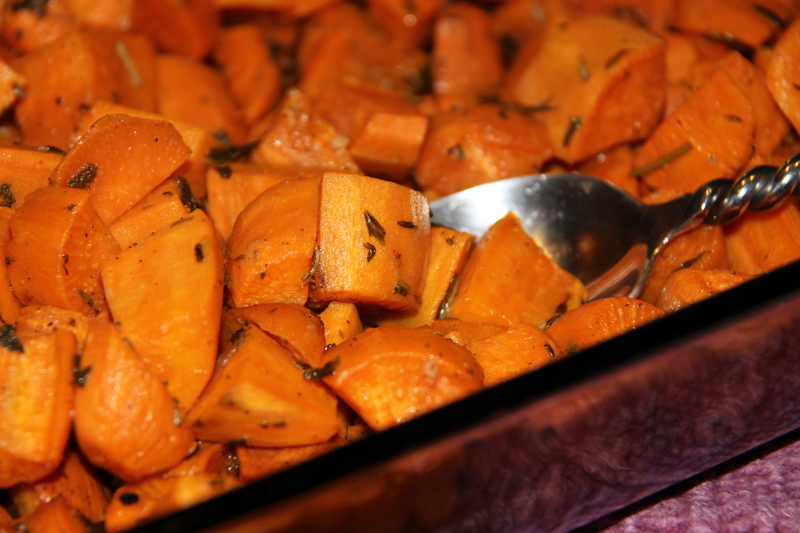 So if you’re a bit on the savory side too, or maybe you just want a change, try this recipe and enjoy a different side of the fabulous sweet potato. Combine all ingredients in a large bowl and toss to coat sweet potatoes with oil and spices. Pour into a 9 x 13 baking dish and cover with foil. Bake at 375 degrees, stirring every 15 minutes until soft. Cooking time will depend on your oven. I have a convection oven and it takes about 1.25 hours to cook the potatoes until soft. This entry was posted in Recipes, side dishes and tagged cooking vegetables, gluten-free, glutenfreevegan.me, glutenfreeveganme.com, going vegan, recipe, savory, sweet potato, sweet potatoes, vegan baking, vegan cooking, vegan recipes, veggies. Bookmark the permalink. I am growing sage in my garden and I have no idea what to do with it until now. I love sweet potatoes too so this will be perfect with my abundance of sage.